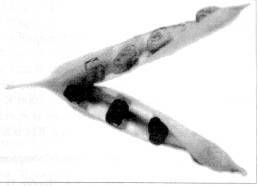 The appearance of an occasional seed with a solid violet-black testa on a plant that otherwise produces seeds with violet-spotted testa, is a well known phenomenon in pea that has been given the name obscuratum [1, 2]. Loennig  presented extensive data on the frequency of occurrence of the obscuratum phenotype in crosses derived from a particular line possessing a violet-spotted testa. The incidence of solid colored seeds in seven families ranged from 1.9 to 8.9%. In confirmation with results of previous investigators, Loennig found that the seeds with solid pigmentation produced plants with all or mostly violet-spotted seeds, indicating that the phenotypic change was not heritable. In general, seeds with the obscuratum phenotype occur singly in a pod, although occasionally two or more seeds in the pod will be affected. However, this year we found two pods both displaying a distinct alternating pattern of seed coat coloration (Fig.1). In one case, the pod came from a hybrid plant from the cross MN313-B16 x A1078-239. The maternal parent is a line from the root rot breeding program at University of Minnesota, and the paternal parent is a multiple marker line originally obtained from G.A. Marx. Both parents possessed the violet-spotted testa gene, although in MN313-B16 this phenotype was masked by homozygosity at a. The source of the second pod with the alternating phenotype was not recorded. Figure 1. Pod from MN313-B16 x A1078-239 hybrid plant in which all seeds on one side display the obscuratum phenotype while all seeds on the other side are normal. The distribution of the obscuratum phenotype within the pod pictured in Fig. 1 suggests that the mutation affected half the carpel. Although the precise extent of the affected tissue cannot be determined due to lack of appropriate gene expression, it appears that the mutation occurred very early in carpel development, presumably before ovule formation. Pods in which all seeds display the obscuratum phenotype may represent instances in which the mutation occurred even earlier in carpel development. The senior author has not observed a case where the obscuratum phenotype has extended to more than one pod on the same peduncle. We have seed from increases of line A1075-239 from 1982, 1985, 1986, 1989, 1997 and 1998 and have not observed the obscuratum phenotype in any of this seed. We conclude that the appearance of the obscuratum phenotype was due to genes in MN313-B16 or novel combinations of genes in F2 plants. 1. Blixt, S. 1972. Agri Hort. Genet. 30:1-293. 2. Lamprecht, H. 1974. Monographie der Gattung Pisum. 3. Loennig, W.-E. 1985. Pisum Newsletter 17:40-42.